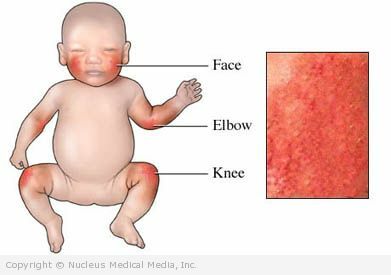 Eczema is a chronic inflammation of the outer layers of the skin. It is most common in infants and children. It can occur in adults. This condition is not contagious. Eczema is also known as atopic dermatitis. Your doctor will ask about your symptoms and medical history. A physical exam will be done. You may be referred to specialist. A dermatologist focuses on skin disorders. An allergist focuses on allergies. Avoid hot or long baths or showers. Keep them less than 15 minutes. Use mild, unscented bar soap or nonsoap cleanser. Use it sparingly. Air-dry or gently pat dry after bathing. Apply gentle moisturizer right after. Treat skin infections right away. It is difficult to prevent eczema. This is most true when there is a strong family history. For bottlefed infants, using a certain kind of formula — Ask the doctor if your baby should have 100% whey protein formula (eg, Nestle Good Start). Your doctor may have more information regarding steps for reducing the risk of eczema. Follow guidelines to limit house dust mites in bedding. Avoid direct contact with wool to the skin. Talk to your doctor about any natural or herbal treatments. Some of these may make eczema worse. Avoid scratching or rubbing when possible. Follow your treatment plan. Improvement may take several weeks or even months after a new medicine is started. Maintain a cool stable environment. Keep consistent humidity levels.